When summer comes I get cravings for something fresh. Suddenly I leap on the cheesecake wagon or other gorgeous and tasty desserts. 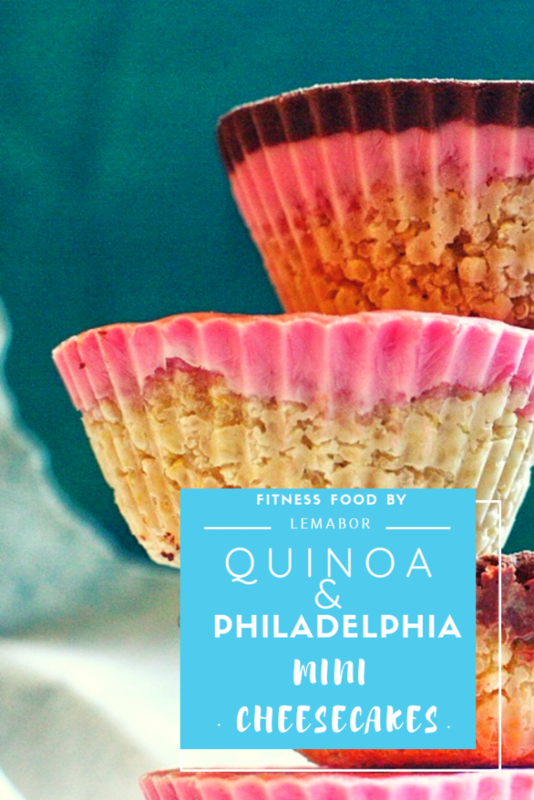 These quinoa and Philadelphia mini cheesecakes are perfect for those days when you want an energy boost, with as little possible effort in the kitchen. Anyone who knows me knows about my passion for cheesecakes and home made ones are my favourites. All flavours are fine with me … I’m pretty democratic. That’s why I like to experiment with this dessert in all its variations. I will create a specific section dedicated only to cheesecakes that I will update from time to time … hoping to have time … with a little girl jumping around and a thousand things to do is not always doable … sigh! 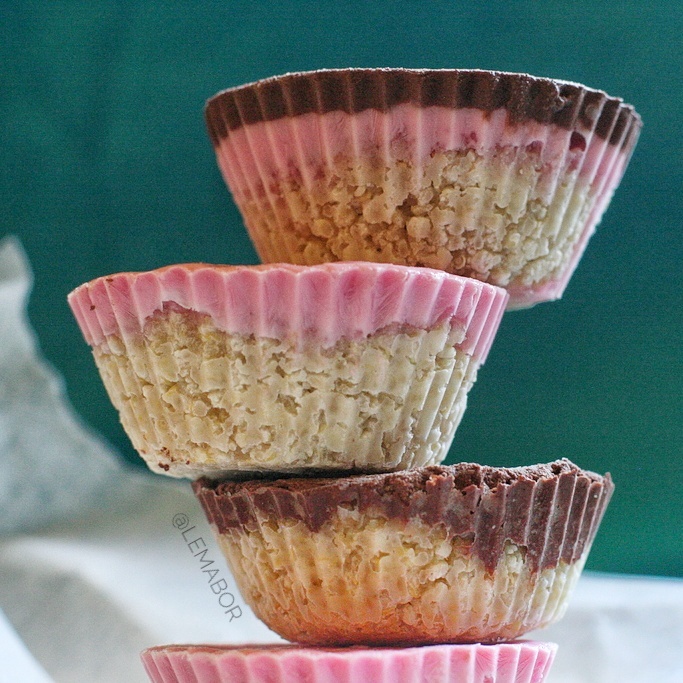 Anyways, these mini cheesecakes are very simple and quick, I guess the most difficult thing to do is cooking the quinoa … and I said it all 🙂 ! Product availability: it’s good, maybe the Philadelphia active can be a little challenging to find because I don’t get it in every store. So I often replace it either with the balance or with the Greek yogurt one, they are both excellent type of Philadelphia . When do I use this recipe? I make these mini cheesecakes for breakfast if I have time to do it, or as a snack even in the evening …There’s people who scrape the bottoms of ice-cream cartons … mmmmh I know one of them 🙂 … and then there’s me gobbling down a couple of my mini delicious cheesecakes. How much did I spend *? To make this recipe, I spent a total of € 3 and € 0.50 each. It all depends on the protein powder price, I buy them online and often take advantage of the daily discounts, so it’s a very variable overall cost. Optional to make them pink: 1 teaspoon of red beetroot juice. Cook the quinoa according to the times on your package. In a bowl mix the quinoa with caseine and coconut oil, if it is still solid, melt it before adding it. Put the mixture in the moulds and press to the bottom to level and compact the base. you can choose more solutions like I did or mix everything and make a single topping. I haven’t tried to stir the dark chocolate in Philadelphia … my bad, but I will try and update this recipe asap. 3) for those with a double layer I first poured Philadelphia and left 10 minutes in the refrigerator to make it more solid then I poured over the melted chocolate, let it cool and put in the freezer for 15 minutes. I haven't tried to stir the dark chocolate in Philadelphia ... my bad, but I will try and update this recipe asap.
) for those with a double layer I first poured Philadelphia and left 10 minutes in the refrigerator to make it more solid then I poured over the melted chocolate, let it cool and put in the freezer for 15 minutes.